TechSpot: How to open Network Connections Adapter Settings Window using Run command? How to open Network Connections Adapter Settings Window using Run command? As far as a Windows System Administrator is concerned, working on the Network Connection settings such as IP configuration and network connectivity troubleshooting is a regular task. For a new Windows Server 2003 or Windows Server 2008 or even Windows Client computer, you will not be able to view the Network Connection Settings icon at the desktop. It will be as always available at Control Panel. 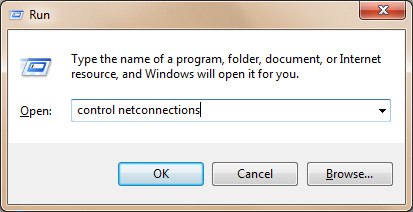 This post will explain how to quickly open the Network Connections window using Run Command. Basically there are two short cuts used to launch Network Connections Window. Press Windows Key+R and launch run and type either of below commands and press enter.